DUBAI, 11th October 2016 (WAM) – In line with the directives and support of His Highness Sheikh Mohammed bin Rashid Al Maktoum, Vice President and Prime Minister of the UAE and Ruler of Dubai, Mohammad bin Abdullah Al Gergawi, Minister of Cabinet Affairs and the Future, has announced the launch of the Awqaf International Organization (AIO), a first of its kind initiative regionally and globally, during the opening ceremony of the third Global Islamic Economy Summit (GIES 2016) held at the Madinat Jumeirah in Dubai. Instituted by Awqaf and Minors Affairs Foundation (AMAF) in collaboration with the Dubai Islamic Economy Development Centre (DIEDC) and the Mohammed bin Rashid Global Centre for Endowment Consultancy, the pioneering initiative is mandated to enhance the role of endowments in the development of societies worldwide. During his keynote speech at GIES opening ceremony, Al Gergawi pointed out that AIO complements the vision of His Highness Sheikh Mohammed bin Rashid Al Maktoum in globalising the Islamic economy ecosystem and enhancing the role of endowments as one of the most important social and economic development tools. “The new organization will unify all local and global efforts to establish a shared system for endowment investments whose laws and regulations are approved by all awqaf organizations worldwide. This step will further enhance the role of the endowment sector and make it a partner in financial transactions and investments in various Islamic economy sectors,” he added. Following the opening ceremony, AMAF held a press conference to announce the details of newly launched Awqaf International Organization. The press conference was attended by Tayeb Al Rais, Secretary General of AMAF, Abdullah Mohammed Al Awar, CEO of Dubai Islamic Economy Development Center, and Dr. Hamad Al Hammady, Secretary General of Mohammed bin Rashid Global Centre for Endowment Consultancy. Also in attendance were representatives of the founding members of AIO, international Islamic economy experts, and members of the global media. Addressing the conference, Tayeb Al Rais, Secretary General of AMAF, said that the AIO was inspired by the vision of His Highness Sheikh Mohammed bin Rashid Al Maktoum, Vice President and Prime Minister of the UAE and Ruler of Dubai. Elaborating on the mission of the new entity, Al Rais said: “This new global initiative is based on our view of the current state of Islamic societies in the region and around the world. Such societies are in urgent need of holistic and sustainable development that is not only in harmony with Islamic values, but also grounded in the realities of modern development. The founding members of the AIO represent several parts of the world. They include: – Awqaf and Minors Affairs Foundation – Dubai Islamic Economy Development Center – Mohammed bin Rashid Global Centre for Endowment Consultancy – Department of Awqaf in Sharjah – Awqaf SA (National Awqaf Foundation of South Africa) – Awqaf Canada (National Awqaf Foundation of Canada) – Awqaf New Zealand – Awqaf USA – Awqaf Australia – The Independent Committee of Islamic Finance in Europe – Awqaf Sheikh Mohammed Abdulaziz Al Rajhi. 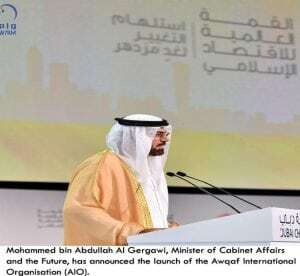 Tareq Abou Nour, Secretary General of the Independent European Committee for Islamic Finance Studies, said: “The launch of this global awqaf organization is the result of the growing interest in the Islamic economy, and its prominent presence in various financial sectors of significance.